Oh...that I loved the very first album of WellenVorm, Toene des Nebels in 2014, where the structures of rhythms were totally dominated by the mortuary atmospheres. This immersion of sounds which broke rhythms and evanescent melodies led us to outstanding sound territories. 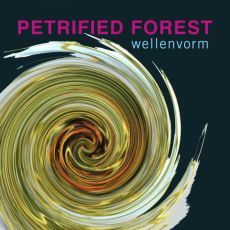 Uwe Rottluff does it again with “Petrified Forest” and his music as gloomy than intrusive which is inspired by the genesis of his home town Chemnitz in Germany (Sachsen) and of the petrified forest which attracts a very large number of tourists. And believe me, that does not take a lot of imagination to be part of these tourists well at warm in our salon with earphones (very important) well screwed on our ears. "Perm" puts us straight in the atmospheres with a thick cloud of iridescent lines from where escape ringings and howlings. The noise of the synth lines weaves a blower of machinery which suffers from its shouts. A movement of sequences extricates itself from this metallic halo in order to wag like an elf who spreads his rhythmic crumbs to find his way back. Always so creative as theatrical, Uwe Rottluff has the art to forge two lines of rhythm which overlap without ever spreading a pace of fire. Here, everything is frozen. The mooing of the sirens comes from everywhere whereas the rhythms and the melodies interlace their stationary charms in a tetanized ambience. The first real skeleton of melody appears in the wonderful and powerful "Twilight". The rhythm is slow but present. It bangs with scattered beatings which let drop the lappings of the hoofs on a hardened surface. The delight comes from a dark synth line which seems to wake up between the torpor of the lavas crystallized in their carbonized membranes. A celestial voice rises over this sleepy fury, adding a horrifying dramatic approach which remains anchored in our ears beyond the borders of "Thunder" and its apocalyptic beatings which disturb a calcified fauna. That does not prevent a very beautiful melodious approach from hatching after the point of 3 minutes. Drinking on the effects of "Twilight", it floats in this universe of perdition where all the noises enchant as much as disturb in an atmosphere which stupefies our senses always on the lookout for a rhythm of which the disrupted approach enriches even more the feeling of suspense which puts ablaze the universe of “Petrified Forest”. After "Blust Wave" which mislaid its scarlet mooings and its irascible thunders in the oblivion, "Nu,e Ardente" propose an approach of post neo e-rock with a structure of atmospheres pierced by slivers of rhythms and of fragments of melodies tried by a fluty synth. These mooing which decorate the eschatological landscape part of “Petrified Forest” stigmatize a vision of disaster which seems to stay this invisible witness of this tragedy arisen some thousands of years earlier. We always stay in these divided rhythms which kick under the gilt of fluty harmonies with the rebel and indomitable, and nevertheless very beautiful, "Crystal Wood" and its crystallized arpeggios which slightly dance in a chthonian atmosphere and in a mid-tempo which looks constantly to join each tip of its phases. This is a strong title where the sound effects, there is plethora here as all over “Petrified Forest”, dominate the ambiences as well as the phases of rhythms and melodies. In a more Berliner style electronic approach, the sequencing does very Christopher Franke here, "Petrified Logs" is also torn between its phases of rhythm which try constantly to connect their ends in atmospheres which are clearly more taciturn, more horrifying. The intensity of the writing style of Uwe Rottluff is always galvanized by summits as touching as the distress of a tribe in front of the inescapable disaster of the blazing fire from the lavas. "Endless Silence" is not as silent as its title indicates it. It’s another compact mass of sounds and of petrified rhythms which try to knot the incoherence and the absences between these phases which feed the dimension of delight and of fright which crystallizes the some 58 minutes of another brilliant album of WellenVorm. An inescapable one for the fans of parallel universes!